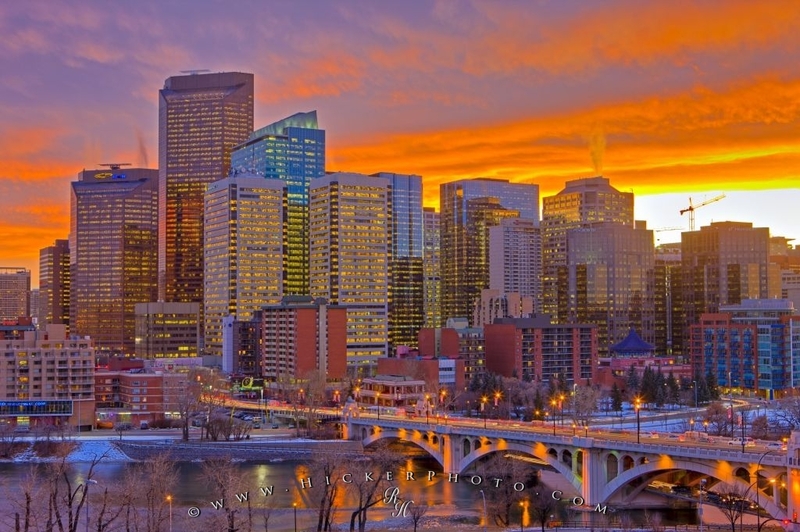 The Calgary city skyline comes alive with color at sunset after a light snowfall in the early winter months. The many high-rise buildings that adorn the Calgary skyline can be seen, as well as the Calgary Tower and the Centre Street Bridge. 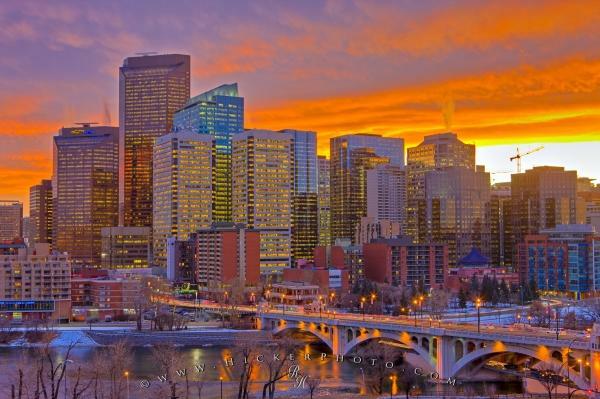 The Calgary city skyline comes alive at sunset, especially after a light snowfall, something which happens quite often in Calgary in the winter months. The city of Calgary is known for getting a heavy amount of snow every year, but at this time in the season, when this photo was taken, just the first flakes have fallen and the city is just sparkling with the extra moisture. When the light at sunset hits such a reflective surface all the colors bounce off and it looks like the city is a multi colored canvas. The Calgary Tower, the many high-rise buildings and the Centre Street Bridge spanning the Bow River can all be seen in this photo and the lights are starting to twinkle as night begins to fall. Picture of the Calgary city skyline during sunset after light snowfall. Pictures from photo gallery "City Pictures"
This picture is part of the photo album "City Pictures" - there are more beautiful images waiting for you. ... The Calgary Tower that can be seen here is an observation tower located in the heart of downtown and is a big tourist draw for people wanting to have a birds eye view of this metropolis. The Centre Street Bridge is a double deck bridge, with the lower deck connecting Riverfront Avenue and Memorial Drive and the the upper deck connects all the way to Crescent Heights. The Calgary skyline looks a lot like other Canadian cities that have many high rise buildings downtown and are surrounded by water. Calgary skyline of high-rise buildings, the Calgary Tower, and the Centre Street Bridge spanning the Bow River at sunset after light snowfall during early winter in the City of Calgary, Alberta, Canada. I photographed this photo with the digital SLR camera model Canon EOS-1Ds Mark III, aperture of f/11.0, exposure time of sec. on ISO 50, as always I used a original Canon Lens, the focus lenght for this picture was 46mm.